American Express remains the most beloved credit card issuer in the country, according to a report released Thursday. For the sixth year in a row, the card issuer has taken first place for customer satisfaction, according to a survey of nearly 14,000 credit card customers conducted by J.D. Power and Associates. The survey asked customers about their issuer's terms, billing and payment process, rewards program, benefits and services, ability to resolve problems and accessibility -- either by talking to a representative over the phone or going through their website or mobile platform. Customers said that American Express (AXP) did the best job in each of these areas, noting that it especially outshines other card issuers when it comes to communicating with customers and offering attractive rewards. 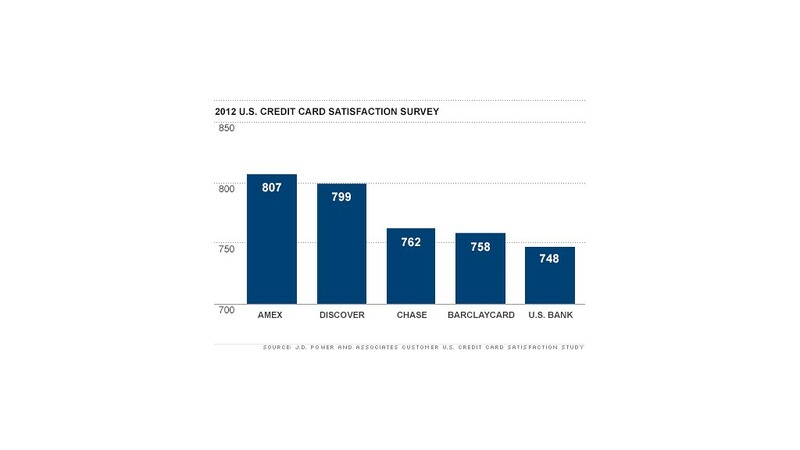 With a score of 807 out of 1,000, American Express narrowly beat Discover Card (DFS), which remained the second place card issuer out of the 11 cards included in the survey, receiving a score of 799 thanks to positive feedback about its ability to quickly and effectively resolve problems for customers. Chase (JPM) moved up in the rankings to the number three spot, increasing its score by 27 points to 762. Customers reported that it has been doing a better job of clearly disclosing terms like fees and has improved its rewards program. Rounding out the top five were Barclaycard (BCS) and U.S. Bank (USB), with scores of 758 and 748, respectively. Citi (C) was one of three card issuers to improve its ranking this year, moving from the 8th to the 6th spot. Customers said they've had an easier time resolving problems with the issuer and that the design and layout of its billing statements have become easier to understand. All 11 card issuers included in the survey saw their scores increase from last year. In addition, the average customer satisfaction score rose for the third consecutive year. Customer satisfaction began steadily increasing after the CARD Act went into effect in 2010, which limited fees and interest rates issuers are able to charge customers. "There has not been a lot of change in the past year in fees, credit limits and card terms -- the things that often affect customers in a negative way," said Jim Miller, senior director of banking services at J.D. Power. "After a series of dramatic changes, credit card customers are enjoying a time of stability." Related: Is mobile banking really safe? That stabilization comes as the retail banking sector remains volatile, with new and higher checking account fees continuing to frustrate customers. For example, only 11% of credit card customers said they experienced a problem with their credit card, compared to 21% of customers who report having a problem with their retail bank, according to a separate report by J.D. Power. And for the customers who do have problems with their credit cards, they have been able to get those issues resolved more quickly, J.D. Power found. Issuers are taking an average of four days to resolve problems this year, down from five days last year, and 84% of credit card customers have had their problems resolved -- up from 82% in 2011.